(Updated) The City of Vancouver administration and City Council are going to be in overdrive for the next several weeks leading up to the annual summer hiatus, which kicks off in the last week of July. Plus the civic election in October 2018 is likely to lead to a major regime change at City Hall. Citizens need to be alert for topics that will affect them, as there seems to be a tendency for major projects and policies to be rushed through in times like these. Future council hopefuls would also be smart to keep a close eye on these topics. Media, social media, and community groups are likely to be covering some of these items. We encourage people to scan down the list to get engaged on any topics that concern you. For example, a few items to watch are the Housing Vancouver Update with many proposed changes in zoning guidelines across the city; many items of “Referral to Public Hearing” including one for a tower by PAVCO beside BC Place that would pierce through a protected view cone. Regarding the Northeast False Creek Update, CVN wrote “Many member groups have volunteered significant time and energy over the last decade working on these issues, only to find that the final reports do not reflect their input. We recommend that these reports be amended to reflect the community’s input as noted above” (size and location of park, tower piercing view cones). Please visit the CVN links for detailed bullet points. For the record, reproduced below are the meeting agendas as of today. An Open House for a proposal to build 98 units of modular housing in two buildings at 688 Cambie Street will take place at the Vancouver Public Library. For interested residents who are unable to attend the Open House, comments can be submitted via email or regular mail prior to June 29, 2018, for consideration by staff. The two buildings proposed on the site are to be situated on the eastern third of the site, along Dunsmuir Street. This would leave the remaining portion of the site open for a future Art Gallery, provided of course, that sufficient funds can be secured for its development. 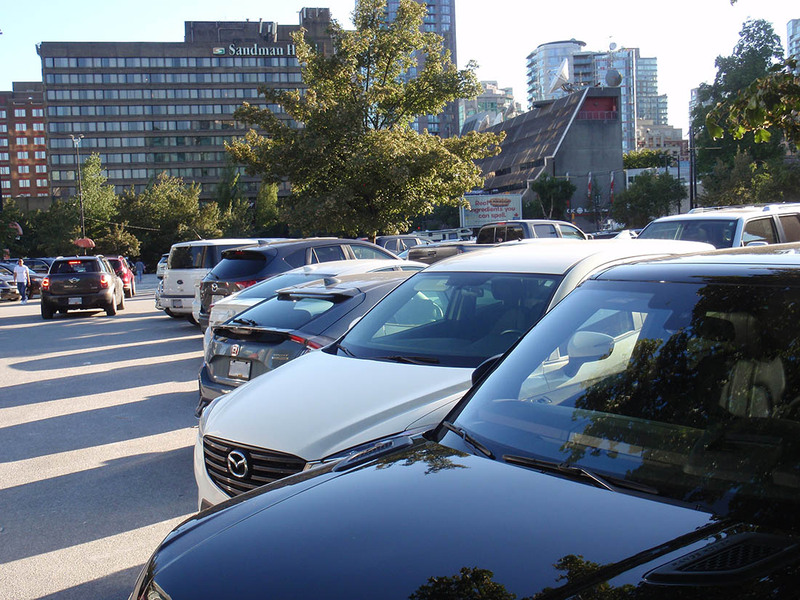 The current EasyPark parking lot is also used for cultural events as well as normal parking for large events at BC Place and Rogers Arena (concerts, plus Canucks and Whitecaps games). The lot is also a key staging ground for film crews, as it is one of the few sites left in the downtown core where large vehicles can park (unlike underground parking or parking garages, film productions need open space for big trucks and tents). The partial loss of Larwill Park for film productions in downtown Vancouver could make the work even more difficult. Film making is an important industry in the region providing thousands of jobs. There is a strong general public acknowledgement that housing solutions are needed. But our policy makers need to juggle many tradeoffs. What options are there for other large lots for modular housing downtown? 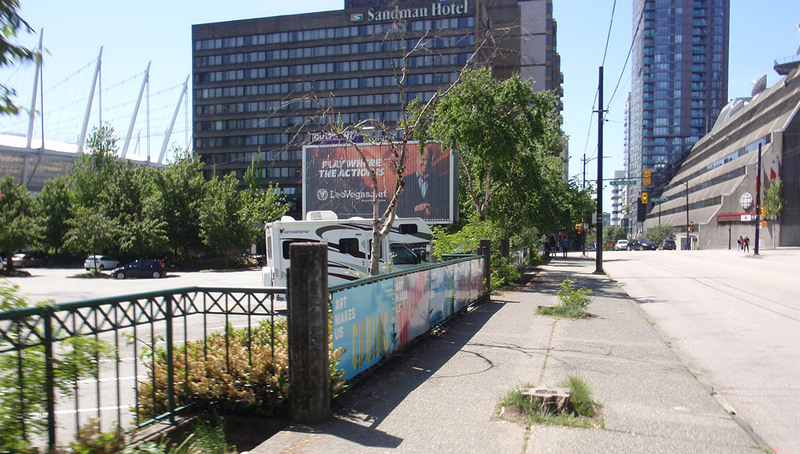 There could be a number of suitable alternatives worth considering, such as the former site of the Continental Hotel (Granville Loops, City-owned land). The City needs to look at the costs and benefits of using each candidate site for modular housing. Certainly there are other important uses of the 688 Cambie site. In terms of geographical distribution of modular housing sites, none are currently proposed west of Oak Street. Would any sites on the Arbutus corridor be available? Should each neighbourhood provide a site for modular housing, after consultation with residents in determining the big picture of optimum sites? How long will these temporary modular housing projects last? Should the government try to provide more permanent housing? Was Millennium truly broke after the 2010 Winter Olympics? The Millennium name and logo appear prominently on the site of a new highrise tower currently under construction at Gilmore and Halifax Street in Burnaby, just north of the Lougheed highway. Our Metro Vancouver region is like a stage with actors appearing and disappearing and appearing again, in a complex weave of connections. This one involves the developer, the lead up to the 2010 Winter Olympics, the 2008 global financial meltdown, a regime-changing election in 2008 from NPA to Vision Vancouver (triggered by confidential documents someone on City Council “left” on a table for media), property seizures, a very quiet billion dollar debt writeoff funded by taxpayers, and more. Some of the key actors have already departed from the stage. While some of the key politicians are still in power until the October 20 election in 2018, it may be the last chance for the media to fill in some blanks in the script and have some more light shone on decisions and actions by the Vision Vancouver regime, while it still has a majority on City Council. As readers may recall, Millennium defaulted on Olympic Village debts and left the City of Vancouver to pick up the $1 billion tab. At the time, the City put claims against 32 properties owned by Millennium, which was hardly enough to recover the costs (according to the City, gross value was $82 million, net value $45). A status report by staff appears to be no longer accessible on the City’s website. Fortunately, we saved a copy of it (Southeast False Creek Development, Update on Negotiation with Millennium, City of Vancouver Technical Briefing, April 8, 2011): SEFCPresentationApril82011. This shows the complexities of the deals. Former City Manager Penny Ballem later released a $1 billion claim against Millennium and thus relinquished all future claims to any right to seize their assets. Ballem was abruptly fired on September 15, 2015. Residents are still waiting for complete answers on how much the Olympic Village default cost the City. Open House June 11th – Does 1st and Clark rezoning follow the Grandview-Woodland Community Plan? 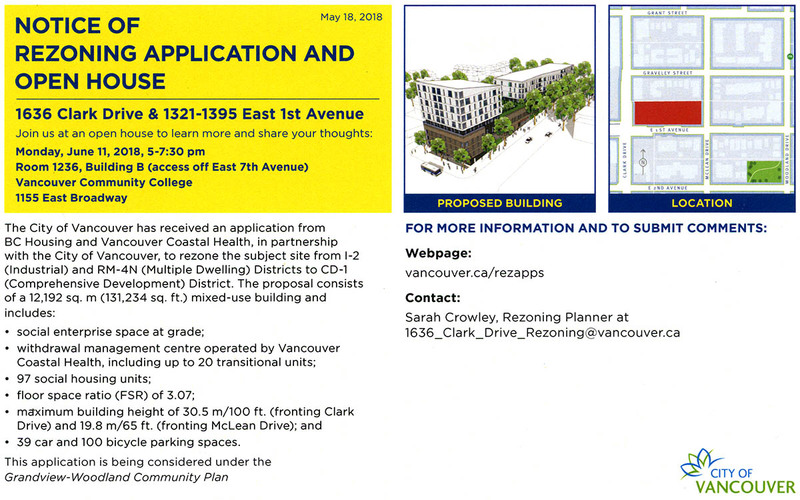 The City of Vancouver has circulated a notice about an Open House for June 11th regarding a block-long rezoning at East 1st Avenue and Clark Drive. On this card, the City asserts that “the application is being considered under the Grandview-Woodland Community Plan.” We’ll look at the plan in more detail and examine whether the application actually meets the rezoning criteria. However, first here’s an overview of the Open House and the proposal. Open House: Monday, June 11, 2018, 5pm to 7:30pm at the Vancouver Community College on 1155 East Broadway (Room 1236, Building B with access off East 7th Avenue). Consultant: Brook Pooni Associates Inc. Architect: HDR l CEI Architecture Associates, Inc. The maximum height of the building is 100′ (30.5m) at Clark Drive and East 1st Avenue and the floor space ratio is 3.07. The proposal is estimated to cost a total of $81 million. The plan includes a one for one replacement for 17 rental units on the site (in terms of total number of rental units, not area). The agreement between the parties would include a 99-year lease of the City-owned land. Additional details are available on the City’s rezoning centre page. The controversial Grandview-Woodland Community Plan was adopted by a majority (but by no means unanimous) vote of City Council on July 28, 2016. 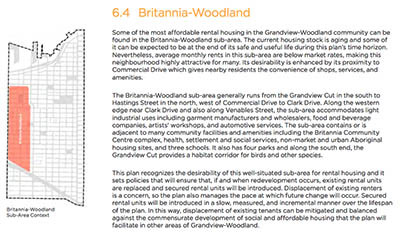 The full text of the Grandview-Woodland Community Plan is available here. This analysis will examine the maximum density and height allowed for the consideration, as written, under the final text of this plan. The land use for the site currently includes two different zoning schedules. These are multiple dwelling unit (RM-4N) and light industrial zoning (I-2). The remaining part of the site is zoned as 4-storey, RM-4N. The intent of the plan is to keep this zone as 4-storey with the exception of allowing a very limited number of rezonings under a pace of change policy (5 rezonings or the loss of 150 rental units over 3 years). The plan is specific about the criteria for a site to be considered for rezoning. There’s a maximum of 6-storey height, density as measured by floor space ratio of up to 2.4, a maximum building width of 36 metres (118 ft), and a T-shaped typology. It’s clear that the application doesn’t meet the criteria as set forth in the plan for consideration to be rezoned. Section 6.4.2 East 1st Avenue speaks to the rezoning criteria (page 79 of the plan). The rezoning sign on the property lists the City of Vancouver as an applicant. The City is also the regulator. As regulator, the City is asserting that the application is being submitted under the Grandview-Woodland Community Plan. Would an outside opinion be appropriate in this instance? It could be possible to have planning staff from another BC municipality review the application, or have independent consultants look at it? 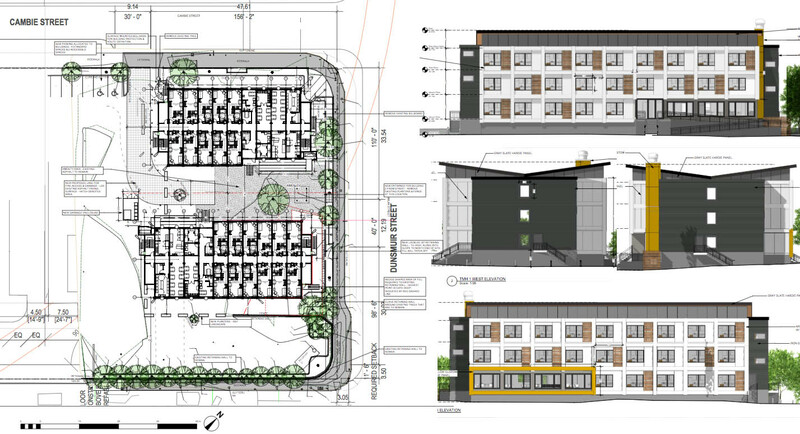 Modular Housing proposed at Larwill Park (688 Cambie): Open House May 15 (Tues). Some points to consider. The City of Vancouver is holding an Open House for a proposal to put approximately 100 units of modular housing on the Larwill Park site (688 Cambie Street). This site is identified as the future location of the new Vancouver Art Gallery. Join us for a community information session on the proposed temporary modular housing project at 688 Cambie Street to learn more about the project and share your feedback. On Sunday, May 13th, there appeared to be no signs posted anywhere around the site about the upcoming Open House at the Vancouver Public Library. That is not acceptable — a lack of public notification. The lot is also a key staging ground for film crews, as it is one of the few sites left in the downtown core where large vehicles can park (unlike underground parking or parking garages, film productions need open space for big trucks and tents). The loss of Larwill Park for film production use could have negative impacts on hundreds or thousands of jobs, by making filming in downtown Vancouver even more difficult. Film making is an important industry in the region. There is a strong general public acknowledgement that housing solutions are needed. But our policy makers need to juggle many tradeoffs. Will Councillor Hector Bremner recuse himself from vote on changes to liquor bylaws at April 17 (Tues) Public Hearing? Potential conflict of interest? Who is he working for — Vancouver citizens? Or his corporate clients? City Councillor Hector Bremner is hoping to be chosen as the NPA’s mayoral candidate in a May 29 decision by his civic party members. But more immediately, as Councillor he will be at a Public Hearing on Tuesday, April 17, from which clients of his employer, the lobbying and communications firm Pace Group, may benefit financially. Will Bremner do the right thing, declare conflict of interest, and recuse himself from participating in discussion and voting on this item? He should. This could be considered a test, and people should also watch to see how he conducts himself. The April 17 problem relates to this Public Hearing item: “Minor Amendments to the Zoning and Development By-law to Enable Liquor Retail Stores in Grocery Stores.” If approved by Council vote, the proposed bylaw will limit liquor sales to only very large footprint grocery stores (over 929 square meters) and exclude small and mid-sized stores. If approved, the bylaw changes will benefit his firm’s clients. Holborn, the developer behind the Trump Tower in Vancouver and the Little Mountain Housing site, is seeking approval of a rezoning to construct a 10-storey, all market rental housing building at 95 West Hastings Street. 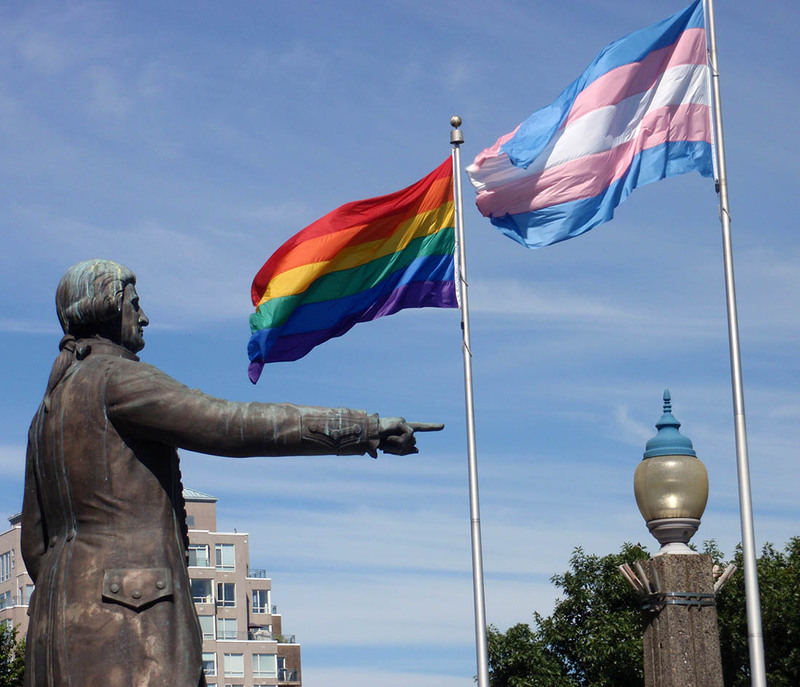 Here we look at the rezoning that City Council is being asked to approve, and the public is asked to comment on — tonight. This proposal is enabled by City of Vancouver policies, but from the public interest perspective, how does this proposal measure up? Does it serve the needs of its host neighbourhood, the Downtown Eastside (DTES)? The public is able to write or speak to Council with comments. Full details on the rezoning are available on the City’s webpage. David Paterson, is the City’s rezoning planner responsible for this project (david.paterson@vancouver.ca) and the applicant contact is Gair Williamson, Gair Williamson Architect Inc. 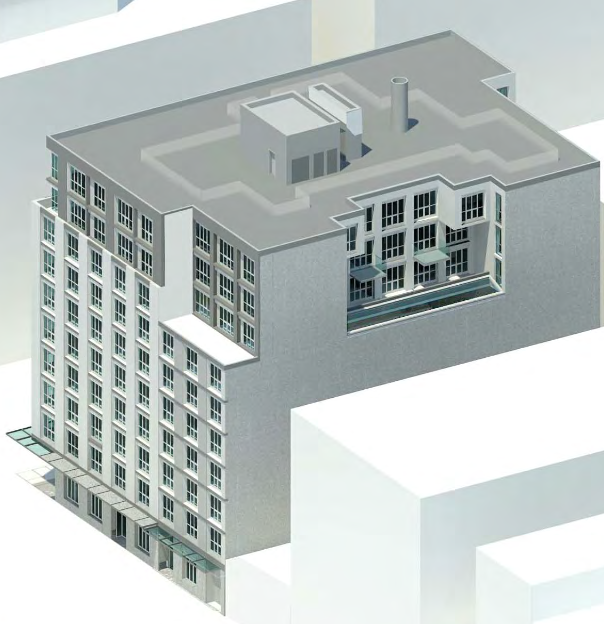 The proposal calls for commercial uses at grade, with market rental housing on floors 2 to 10. A full waiver of community amenity contributions (CACs) is also proposed. An interesting note about the floor area is that at 99,073 sq ft, it is just below the 100,000 sq ft threshold, which means there’s no public art contribution. Otherwise there would be $1.98 / sq. ft. public art contribution (or approx $2 million).